from 3 pcs. 5.63 € 9% -0.62 €/pcs. from 8 pcs. 5.31 € 15% -0.94 €/pcs. 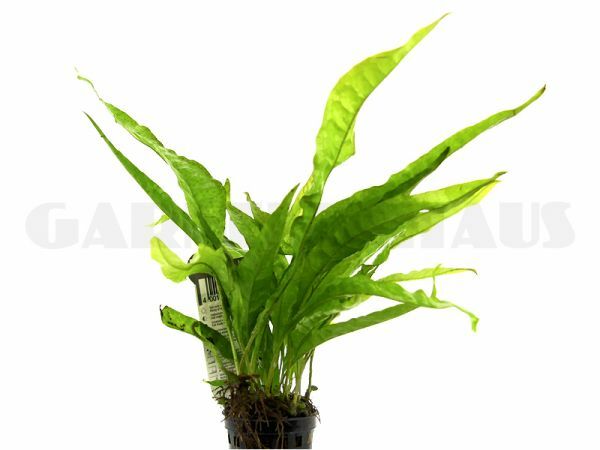 The epiphytic fern Microsorum pteropus (Java Fern) from the Asian tropics and subtropics has been a popular aquarium plants for many decades. It is very easy to care for and does well under relatively low light. Java Fern has a rhizome, which is not put into the substrate but best attached to pieces of driftwood or rocks with thread. The plant develops a fine mesh of aereal roots with small holdfasts, and bit by bit, Java Fern will take hold on the substrate. The plant is easy to propagate: simply cut off part of the rhizome..
Before putting this plant into a shrimp tank, carefully remove the plastic pot as well as the rock wool around the roots, and quarantine it for some days in a separate container. Change the water daily and provide sufficient light. In the nursery, these plants may have been treated against algae or snails, and this procedure is necessary to get rid of these substances that might be harmful for shrimp. Healthy plants and very full pots. sieht gut aus und ist seit Erfindung des Pflanzenklebers auch sehr gut auf Holz oder Steinen zu befestigen. Javafarn ist fast "unkaputtbar", es sei denn, man gräbt sie in den Bodengrund ein. bisher hatte ich in jedem meiner Becken einen Javafarn. Schöne große kräftige Pflanze! Schnell geliefert! Bin sehr zufrieden! Vielen Dank! Schön gewachsene kräftige Pflanze! TOP!!! Kann ich empfehlen!